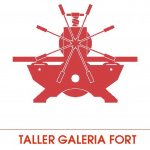 We are very excited to announce an upcoming exhibition in one of Cadaques’s most beloved art galleries – Taller Galeria Fort. A gallery renound for their print work which offers visitors an international selection of prints, thanks to the many artists wishing to participate in their yearly prints competition. Launching on Saturday 28th of March, Xitina’s prints will be showcased throughout the week until Sunday the 12th of April. I love your paintings! Will you be doing an exhibition in the north west?